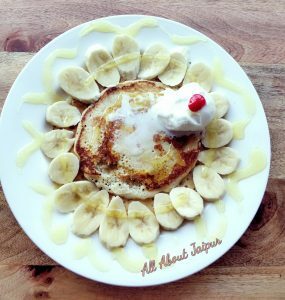 This Famous Jaipur Café is Making its Comeback to the City! When we got to know the ‘On the Way’ Café was reopening its doors we couldn’t resist giving the place a visit. As soon as you walk in through the doors you will be greeted to a sight of quirky and colourful decorations. 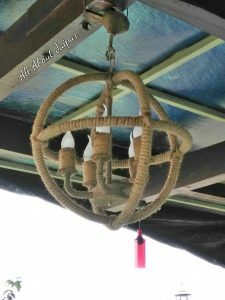 Located at the rooftop of Hotel White Lily, the place was very warm and inviting. 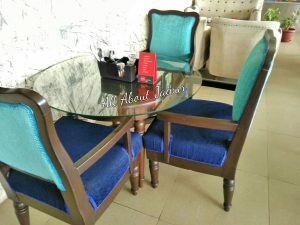 Speaking of decorations and furniture one generally finds that restaurateurs these days try to follow a theme to set their place apart from the other hundreds in the city. However, we found this detail a little lacking in On the Way. The café houses a combination of old worn out looking leather sofa chairs as well as new colourful dining chairs. The interiors felt slightly mismatched. The café is decorated with elegantly painted artworks; framed photos; floor-to-ceiling windows and a long bar added to the feel of the café. As we stepped outside we were blown away by the gorgeous city view. Nestled on the sidelines of a busy street one can simply pass time watching the view and sipping on a cup of coffee. 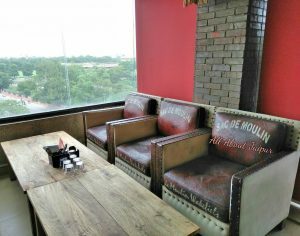 The rooftop of the café was very well-designed with colourful couches sitting on iron chariot wheels. 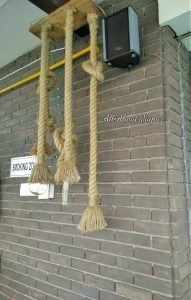 We really loved the elegant filament bulbs hanging from jute ropes. 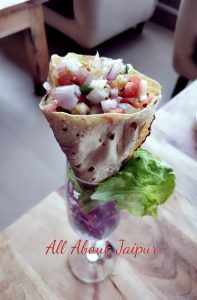 The food menu was well categorised offering multi-cuisine options like Indian, Chinese, Italian, Mexican, among others. We kicked off our meal with Watermelon Mojito, Kit Kat Shake and Oreo Shake. 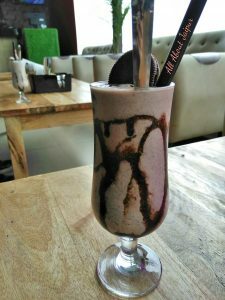 The Oreo Shake was the best of the lot super thick, creamy with just the right amount of ice and the flavours of chocolaty Oreos pouring through. The Kit Kat shake was also delicious and well decorated with a piece of kit-kat on top. 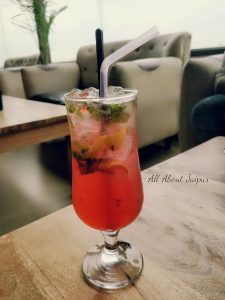 The watermelon mojito although super refreshing lacked in the ‘Au Naturale’ department, would have liked a little more ‘fresh fruit’ in it. 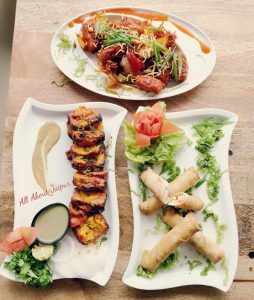 Moving on to the entrees we tried out the Pink City Paneer Chow Chow; Crispy Cigar Rolls; Mexicano Salad, Masala Papad and Lal Surkh Paneer. The Pink City Paneer Chow Chow tasted absolutely delicious, crispy noodles and the paneer was well coated in a tangy red sauce, which we simply couldn’t get enough of! The Lal Surkh Paneer was a plate of juicy paneer tikkas, well flavoured and charred to perfection. The dish was served with mint chutney which you should definitely ask more for because it is simply delicious! We were a little disappointed with the Cigar Rolls. The cheese in the rolls had a weird smell to them which made the dish quite unappetizing. The filo pastry coating was however quite crispy and light. 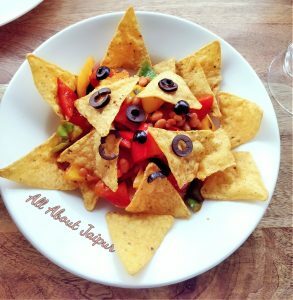 The Mexicano Salad was basically a hot plate of nachos with baked beans in the centre. We weren’t very fond of this dish, the beans tasted good but the nachos were store bought. Its cheesy flavor did nothing to bring the dish together and large chunks of capsicum found themselves discarded to the side of the plate. Masala Papad was served in a champagne flute. We couldn’t understand why. It made the whole thing very difficult to eat with the filling inside falling out everywhere and making the papad soggy. Sometimes simplicity is best suited. For the main course, we tried Cottage Cheese Shashlik; Paneer Makhani; Soya Lababdar; Jodhpuri Chakki; Olive Paratha and Butter & Tandoori Naan. The Shashlik was very well-plated. 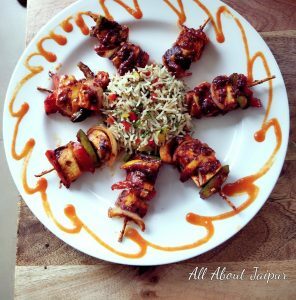 The rice was packed with flavours and the shashlik on the stick was well-coated in the sauce and cooked to perfection. Paneer Makhani; Soya Lababdar and Jodhpuri Chakki all added to the growing list of feel-good recipes in the menu. 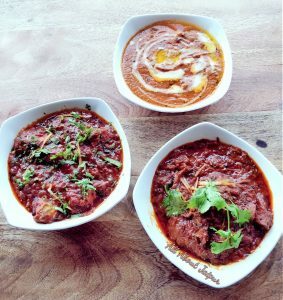 Each item unique in its own taste was full of flavours, light and delicious to eat. We couldn’t stop licking our fingers after trying out the Soya Lababdar. The soya tikkas were so soft and juicy, they simply melted in your mouth. 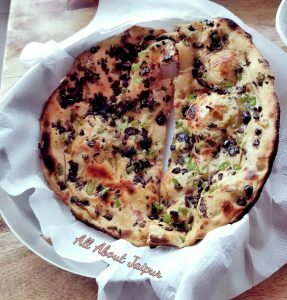 The showstopper was however the Olive Paratha. This never before seen dish was as delicious as it was stunning! The little bits of olive in your mouth tasted very good with the accompaniments. With no room left for dessert, we let our temptation win and tried the Chocolaty Pineapple Pizza and Banana Pancakes. The Pizza was a serious disaster, this dish simply needs to be better thought out. 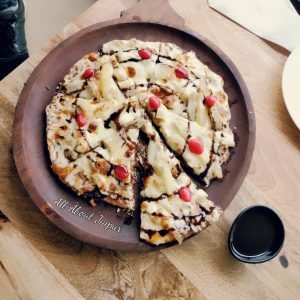 The cheese with the pineapple and the chocolate sauce is a recipe for a major faux pas! That sums up our entire experience. We recommend you to try out this café after all it’s ‘On the Way’!